William M. Cox, son of James Monroe Cox and Martha Abernathy, husband of Malissa Hite..
Malissa "Lissie" Hite, daughter of William Hite and Mary Stroup, wife of William M. Cox. Funeral services for Mr. William Cox, 60, beloved Bartow County pioneer, who died at his home near Cartersville Sunday following a short illness, were conducted Monday afternoon at two o’clock from the Macedonia Church. Rev. Raymond Banks assisted by Rev. Howard Cordell, officiated in the presence of many sorrowing relatives and friends. Mrs. Lissie Hite Cox, 71, of the Center community, died at 5 a.m. Friday, July 10, at her home after a five-month illness. A native of Bartow County, she was born November 10, 1882, a daughter of William and Mary Stroup Hite. Her husband, W.M. Cox, died in 1938. She was affiliated with the Center Baptist church. Funeral services were held at 11 a.m. Sunday, July 12, at Center Baptist church, with the Rev. R.N. Banks officiating. Interment was in the Macedonia Cemetery. Pallbearers were listed by Owen Funeral Home as follows; Herbert Cox, Eugene Cox, Clyde Cox, Billy Shaw, Billy Branton and Clifford Moss. Survivors include three daughters, Miss Annie Cox, Mrs. Ben Woods, and Mrs. Sam Jarrett, all of Cartersville; five sons, Nat Cox, Billy Shamley Cox and Wes Cox, all of Cartersville, Leroy Cox of Rome, and Harold Cox of Fairmount; two sisters, Mrs. Fannie Lou Bailey of Plainville, and Mrs. Marshall Whitfield, of Atlanta; five brothers, Elisha Hite, of Atlanta, Cleve Hite, of Ringgold, Wes Hite and John Hite, both of Adairsville, and Jim Hite, of Cartersville; 14 grandchildren and seven great grandchildren. 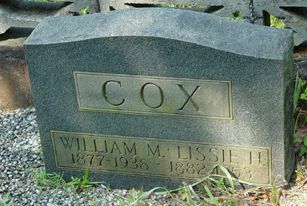 Husband’s name is William M. Cox. Daughter Mrs. Ben Woods is Eva Cox. Daughter Mrs. Sam Jarrett is Lottie Mae Cox. Sister Mrs. Marshall Whitfield is Emma Hite.